These Large, 1" Transparent Dice are available with your designs custom printed on one to six sides of the dice. 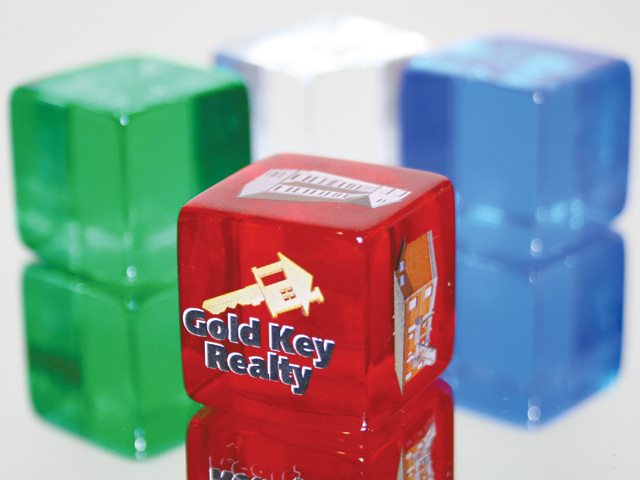 Our 1" Customized Dice are made of a durable acrylic plastic, so they are transparent, like casino dice are. 1" Branded Dice are our largest size available (we also offer 1" Opaque Custom Dice), so these dice are great for printed phrases, larger/complex images, and other custom prints that need a larger print surface. You can print whatever you prefer – from sayings and logos, to full color photos. Our Oversized 1" Transparent Dice are available in your choice of Blue, Clear, Green, or Red. The minimum order is 500 pieces of Custom 1" Transparent Dice. Custom Dice Pricing – Includes Up to 6 Different Full Color Designs on the Sides!